Can’t get enough Legend of Zelda away from the console? Well, why not pass the day with some sounds from the game in order to help you with your withdrawal symptoms courtesy of these Legend of Zelda Sound Drop Keychains. From crossbow sounds to bombchu explosions you’ll be sure to find some great uses for each sound. Our favorite is the “you solved the puzzle” music… it makes us feel like we accomplished something wonderful… just by pushing a button. Nothing like a Pavlovian response to kickstart the day, eh? 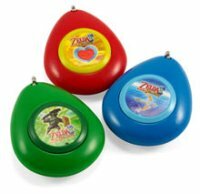 The Legend of Zelda Sound Drops will retail for $4.99 a pop, and they will be shipped randomly so you will probably have to make more than six orders in order to pick up the entire set.